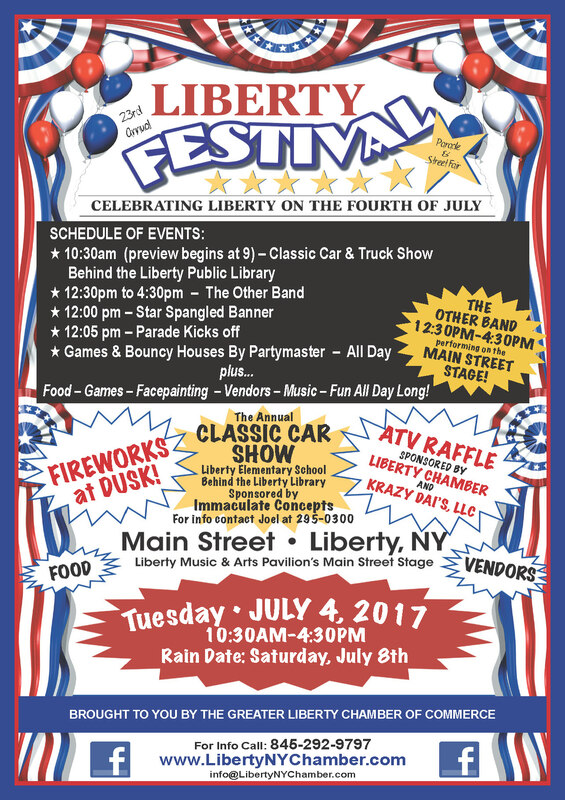 The Greater Liberty Chamber of Commerce, in cooperation with the Village and Town of Liberty, will be hosting its Annual Fourth of July Celebration on Tuesday, July 4th. The Chamber is inviting retail, food and craft vendors—as well as community organizations---to participate in the Annual Street Fair and Parade. The street fair runs from 10:30 a.m. to 4:30 p.m, with the parade kicking off at 12:05 p.m. across from the Elks Lodge on Oberferst Street. North Main Street will be closed to vehicle traffic to accommodate the festivities. The day also includes: A Classic Car and Truck Show beginning at 10:30 a.m. (preview 9am) behind the Liberty Public Library; a special performance of the Star Spangled Banner at noon on the Main Street Stage; a variety of food, craft and retail vendors; bouncy houses and kids activities by Party Master; and musical guest “The Other Band” on the Main Street Stage starting at 12:30 p.m. A rain date is set for Saturday, July 8th. We also encourage and welcome all local service organizations, volunteer groups, businesses, classic car and tractor owners, etc. to show your pride and participate in this year’s parade. Together we can make it Liberty’s biggest 4th of July parade yet! Lineup begins at 11:00 am. Parade kicks off at 12:05 sharp! The Greater Liberty Chamber of Commerce is a 100% Volunteer Organization and is funded entirely through its own fundraising efforts. Please call for more information on this or other upcoming Liberty Chamber events, as well as to join, or to volunteer. Contact the Greater Liberty Chamber of Commerce by phone at 845-292-9797 or email info@LibertyNYChamber.com. Information can also be found on the Greater Liberty Chamber of Commerce Facebook page or online at www.LibertyNYChamber.com.